contact person: Nikki Stewart, nstewart@uses.org or (617) 375-8108. United South End Settlements brings the community together through exhibitions, events, and partnerships, using art as a catalyst for communication and relationship building across different cultural and socio-economic backgrounds. The Harriet Tubman Gallery showcases a range of diverse cultural and community driven works that foster a strong sense of neighborhood appreciation where all individuals are welcome. Free and open to the public, stop by and visit us at 566 Columbus Ave in Boston’s South End, Monday through Friday 8:00 am to 6:00 pm. 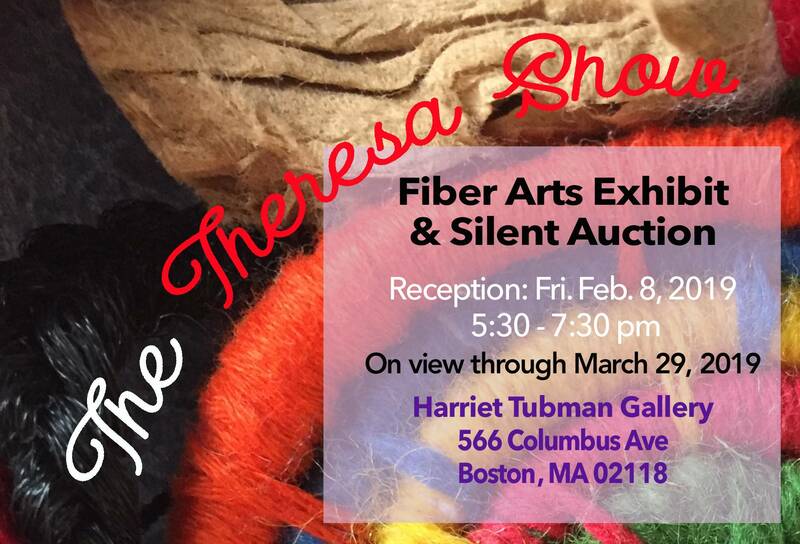 The Theresa Show is an annual exhibition honoring the late Theresa-India Young, a local fiber artist whose interest was to preserve the art, history, and diverse culture of weaving. Proceeds from the silent auction benefit the Theresa-India Young Ethnic Weaving Scholarship at Massachusetts College of Art and Design. Participating artists include: Stacy Arman, Geraldine Barney, Malika R. Crichlow, Eleanor Elkin, Judith P. Felton, Hetty Friedman, Paul Goodnight*, Paul Harrington, Karen S. Hohler, Lahya Hyppolite, Reginald L. Jackson, Ph.D.*, Patricia McSweeney, David Mynott II, Selina Narovlansky, Jeffrey Nolan, Rachel C. Oswald, Salomé Deta Pitts, Etta M. Rosen, Susan G. Thompson, Johnetta Tinker, Karen A. Weinhaus and 2018 scholarship recipient Zoë Barbano-Grinder.